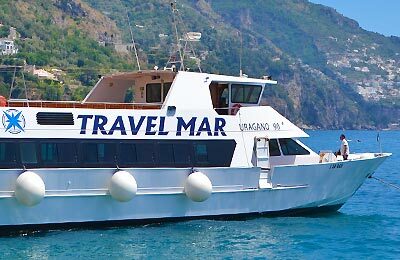 Book Ferries along the Amalfi coast of Italy with Travelmar and AFerry! Travelmar has been providing ferry services along the Amalfi coast since 1998. 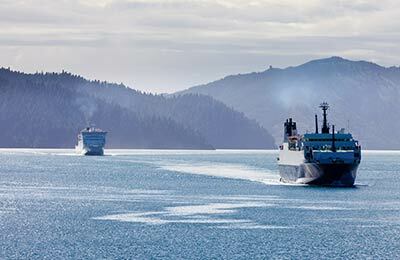 The company offers a relaxing and enjoyable alternative to navigating the coast by car. With AFerry, you can book Travelmar ferries to Positano, Amalfi and Salerno. See below for detailed timetable information and the best prices customers have found recently. If you see a price you like, use the Get Price button to book! Travelmar operates a fleet of four vessels; the Ferry Polaris, the Ferry Uragano 90, the Ferry Maria Madre and the Ferry Alcor. The Ferry Alcor is a smaller ship carrying up to 162 people, while the other ships in the fleet have capacity for upwards of 300 people. All ships can reach speeds of up to 18 knots, and have open deck seating allowing you to cruise in style and take in the spectacular views of the Amalfi coast. Travelmar has been operating speedy and comfortable services along the Amalfi coast since 1998, providing a stylish and relaxing alternative to the winding roads along the coast. Whether you choose the Travelmar Positano Salerno route, the Amalfi Positano service, or any other Travelmar sailing, you are bound to have a relaxing and comfortable journey safe in the knowledge that you got a great deal with AFerry. How long before departure should I arrive for Travelmar? Check-in is at least 15 minutes prior to departure for all passengers.